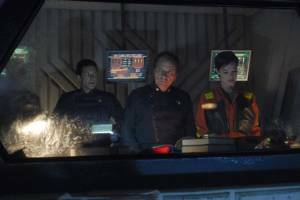 1/20/07: Based on the promo pics, the present-time story seems to involve an incident on the flight deck that lands Cally in sickbay. Seemingly random Dee and Gaeta hallway photo. 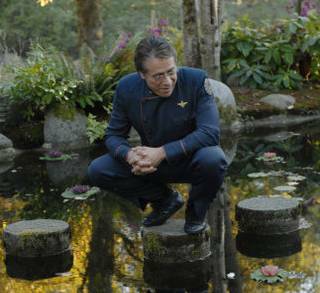 Adama appears to be enjoying a peaceful pond. Adama looks lost in this thoughts out of his uniform. Lee and Adama monitor the hangar deck from the flight pod. Cally ends up in isolation. 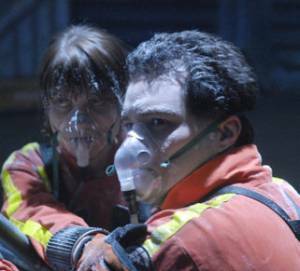 Cally and Tyrol hold each other on the flight deck with oxygen masks. 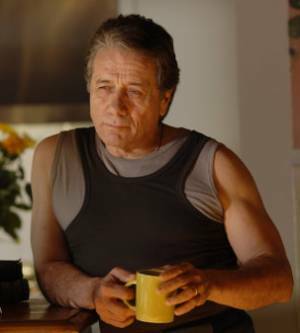 11/27/06: Adama missed his tenth wedding anniversary because of riots on Aerilon. Caroline finally left when Adama re-upped and got his first command, but didn't tell her. She found out thanks to a congratulatory call from a drunken Tigh. 10/11/06: Adama has several introspective sequences where he and his remembered version of Caroline discuss their marriage. 10/11/06: Private Jaffee looks to be little more than a walk-on part and not a pivotal guest character. 10/7/06: Flashbacks include what Lee's life was like after Papadama left. 10/3/06: Adama's reminiscing is triggered by the 29th anniversary of his marrying Caroline. 9/30/06: Caroline is Adama's ex-wife. Presumably, she's seen in flashback.